(Nanowerk News) Scientists with the U.S. Department of Energy (DOE)’s Lawrence Berkeley National Laboratory (Berkeley Lab) have used a unique nano-optical probe to study the effects of illumination on two-dimensional semiconductors at the molecular level. Working at the Molecular Foundry, a DOE Office of Science User Facility, the scientific team used the “Campanile” probe they developed to make some surprising discoveries about molybdenum disulfide, a member of a family of semiconductors, called “transition metal dichalcogenides (TMDCs), whose optoelectronic properties hold great promise for future nanoelectronic and photonic devices. “The Campanile probe’s remarkable resolution enabled us to identify significant nanoscale optoelectronic heterogeneity in the interior regions of monolayer crystals of molybdenum disulfide, and an unexpected, approximately 300 nanometer wide, energetically disordered edge region,” says James Schuck, a staff scientist with Berkeley Lab’s Materials Sciences Division. Schuck led this study as well as the team that created the Campanile probe, which won a prestigious R&D 100 Award in 2013 for combining the advantages of scan/probe microscopy and optical spectroscopy. With the Campanile probe, optical excitation and collection are spatially confined to the nano-sized gap at the apex of the tip, which is scanned over the sample, recording a full emission spectrum at each position. Schuck, who directs the Imaging and Manipulation of Nanostructures Facility at the Molecular Foundry, is the corresponding author of a paper describing this research in Nature Communications ("Visualizing nanoscale excitonic relaxation "). 2D-TMDCs rival graphene as potential successors to silicon for the next generation of high-speed electronics. Only a single molecule in thickness, 2D-TMDC materials boast superior energy efficiencies and a capacity to carry much higher current densities than silicon. However, since their experimental “discovery” in 2010, the performance of 2D-TMDC materials has lagged far behind theoretical expectations primarily because of a lack of understanding of 2D-TMDC properties at the nanoscale, particularly their excitonic properties. Excitons are bound pairs of excited electrons and holes that enable semiconductors to function in devices. Campanile-bellsThe Campanile probe, which draws its name from the landmark “Campanile” clock tower on the campus of the University of California at Berkeley, features a tapered, four-sided microscopic tip that is mounted on the end of an optical fiber. Two of the Campanile probe’s sides are coated with gold and the two gold layers are separated by just a few nanometers at the tip. The tapered design enables the Campanile probe to channel light of all wavelengths down into an enhanced field at the apex of the tip. The size of the gap between the gold layers determines the resolution, which can be below the diffraction optical limit. In their new study, Schuck, Bao, Borys and their co-authors used the Campanile probe to spectroscopically map nanoscale excited-state/relaxation processes in monolayer crystals of molybdenum disulfide that were grown by chemical vapor deposition (CVD). Molybdenum disulfide is a 2D semiconductor that features high electrical conductance comparable to that of graphene, but, unlike graphene, has natural energy band-gaps, which means its conductance can be switched off. Comparison between image of MoS2 flake captured with Campanile probe and image of same flake captured with scanning confocal microscopy shows the Campanile probe’s enhanced resolution. 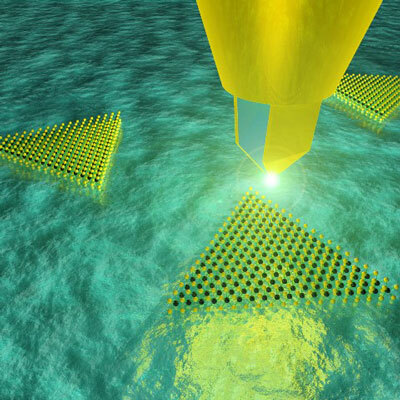 In this study, Schuck and his colleagues also discovered that the disordered edge region in molybdenum disulfide crystals harbors a sulfur deficiency that holds implications for future optoelectronic applications of this 2D-TMDC. Schuck and his colleagues plan to next study the excitonic and electronic properties that may arise, as well as the creation of p-n junctions and quantum wells, when two disparate types of TMDCs are connected. “We are also combining 2D-TMDC materials with so-called meta surfaces for controlling and manipulating the valley states and circular emitters that exist within these systems, as well as exploring localized quantum states that could act as near-ideal single-photon emitters and quantum-entangled Qubit states,” Schuck says.